Half Dome...another magnificent granite mountain...also a favourite of Adams...his most famous and endearing capture being Moon over Half Dome...a stunning photographic masterpiece. The light plays games with Half Dome...the character or approachability of the huge mountain changes with the time of day, and time of year. 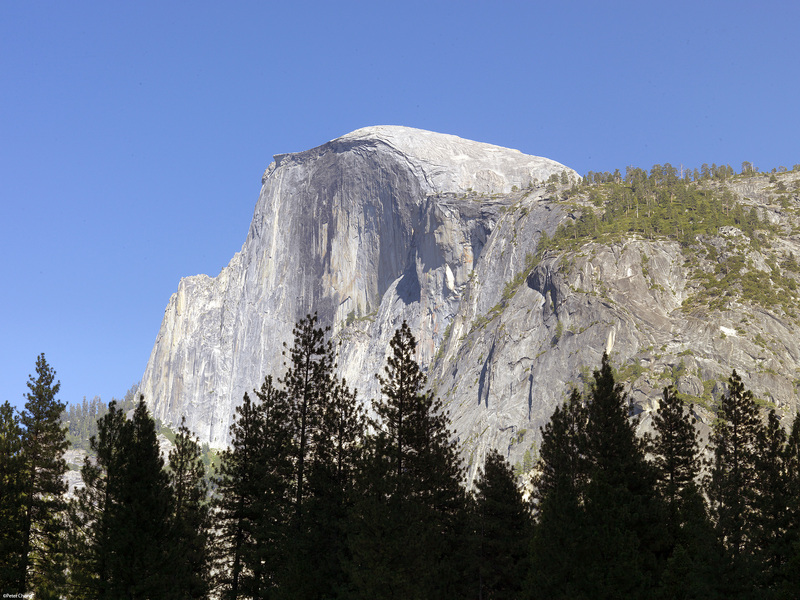 In the day, the granite of Half Dome is forbidingly hard, imposing in stature and powerful. I made this shot from the Curry Village car park, shot in harsh daylight. 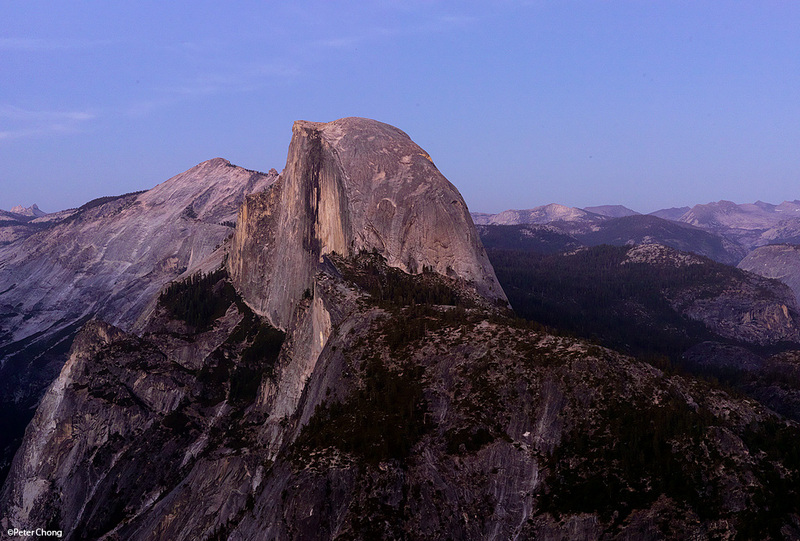 I intentionally placed the trees in the foreground in Zone 1, making them mainly silhouettes, allowing the immense strength of Half Dome to force itself into the photograph. 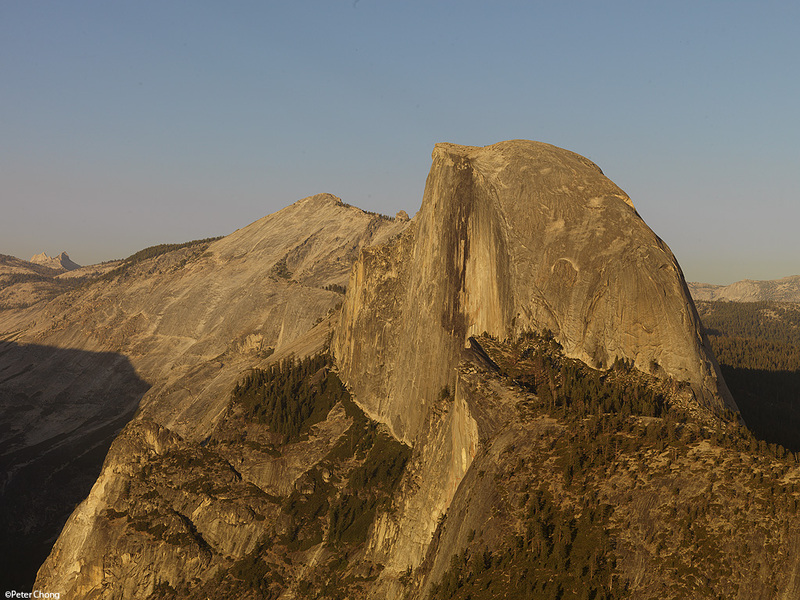 Half Dome changes again, even in the same mid-day light. 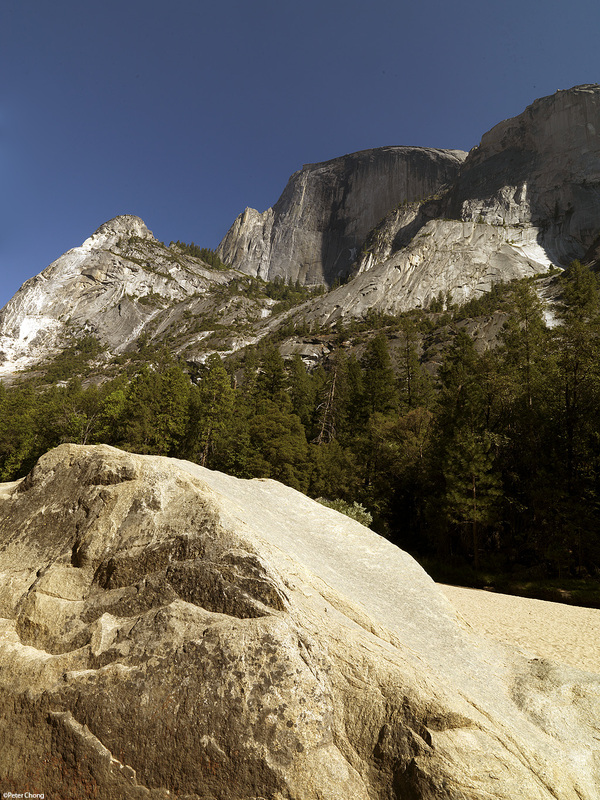 The next shot was taken from Mirror Lake, at the foot of Half Dome. We had seen a poster at our hotel in Mariposa, showing Half Dome, reflected on a pool of water, and had wanted to capture the same image. Mirror Lake was originally a small lake at Tenaya Creek between the peaks of Half Dome and North Dome. But artificial attempts to make a dam in the interest of an early tourism attraction in the late 1880s and mining of the sand caused sediments to accumulate, and the lake is close to disappearing. Only in the peak of spring and early summers, when the snow melt makes torrents of water come down the peaks is it a lake. Most of the time, as it was when I visited, it remains a dry sandy valley. It was a hot day when I shot there...the lake bed threatening to bake me and my equipment. A little stream flows where a lake would have been in high water. Where I set up my tripod, during high water season, would be submerged under water some 1.5 to 2m, leaving only the very top of the boulder in the foreground above water.. I placed the shadows of Half Dome in Zone 5, and allowed the rest of the exposure to fall where it did. But by evening, at sunset...Half Dome...the warmth and glow of the setting sun, makes the mountain look less forbidding...and a little more approachable. This shot from Glazier Point lookout. At an elevation of 7,214 feet (2,199 m), 3,200 feet (980 m) above Curry Village, looking directly into the face of Half Dome. The golden light of the setting sun, creates a glow on the peak. Shot with the 120mm lens. This next shot was taken just after the sun had set. Bathed in an eerie moonlight, of blue, almost lilac hues, the imposing mountain becomes even more approachable, pretty even. With this light, it is an almost frantic bid to capture the image before the entire scene plunges into darkness. I managed to get sufficient light to shoot at an exposure of 3s at f/16 only by pushing the digital back to ISO800, compared to ISO50 I have used for the earlier pictures. I selected the 80mm lens, which shows a different magnification to the one above, but also a slightly different perspective...a more normal vs a compressed telephoto view to the former.